Accommodation and tourist seasons in Avignon. Vaucluse heritage is important, and has nearly 500 monuments protected as historical monuments, including 155 in Avignon, a city declared UNESCO World Heritage. As such Avignon offers a range of accommodation, including exceptional in old charming residences. Among the wide range of hotels you can choose to enjoy the charm of the city or the quiet of the surrounding countryside. Warning! during the theater festival in July there are many, prices are rising and it is necessary to book in advance. If you want to be in the city during the festival book as early as March. You will find on the official website of the Office of Avignon many information to organize your stay in the city of Popes: accommodation and food, history and culture, weather, shopping and crafts, recreation and sports, outings and events, how come Avignon, etc ... In addition to this valuable information, you can also book directly on this website a hotel or a rental in the region of Avignon, but a guided tour, a tour, a show or stay. Which hotel at what price? The budget accommodation in Avignon. The rates for hotels vary depending on tourist seasons: the prices given below are therefore orders only. -Not expensive: 30-50 euros / night -Good market: up to 75 euros / night -Price medium: 80-120 euros / night -Comfortable: around 150-200 euros / night -Top range: 200 euros / night to several thousand euros for a luxury hotel! Before you leave take a little time to find your place on the internet, see the comments, the various services, the situation of the hotel. Look carefully you will find affordable hotels in the city center and in the tourist areas. Choose your accommodation according to the type of stay and vacation you want to go; rural tourism, city break, relaxing stay and wellbeing, gastrointestinal or luxury. Ideally, it is better to book in advance for the hotel in Avignon more choice and increase your chances of getting the best rates. To book a hotel in Avignon the easiest thing to go through internet hotel booking sites are ideal for comparing offers and sort according to its budget. Additionally, specials are not rare, glancing regularly, it is common to come across a good deal. Where to stay? The Avignon neighborhoods. Avignon has developed between the Rhone and the Rocher des Doms. In Avignon there is a walled town and extramural city. Most charming addresses are located within the city walls. The difference in architecture between intra- and extramural is obvious. Between the walls there are narrow streets, blind alleys and old buildings. By cons, outside walls, buildings are modern and often without charm, but this is of course that we find cheap hotels addresses. In Avignon, much to say directly, many visitors have complained of insecurity prevailing in the city center but mostly in extramural city, especially avoid neighborhoods of Monclar and Chamfleuries, the area of ​​the station and the Avenue of the Republic the night, and the island of Bartellasse. Some dream hotels in Avignon. -The Mirande, historic luxury hotel located in the city center of Avignon. It offers rooms overlooking the Palais des Papes. -Avignon Grand Hotel, luxury hotel located just outside the medieval walls of the city. It has a small rooftop pool. -Hotel Cloitre Saint Louis Avignon, another historic hotel with an outdoor pool with a large sun terrace. -Mercure Papal city, hotel on the Place de l'Horloge, in the heart of the historical center of Avignon. -Hotel Clock, another beautiful hotel overlooking the Place de l'Horloge. -Novotel Avignon Center, located near Avignon Train Station, this hotel features an outdoor pool and a beauty salon. 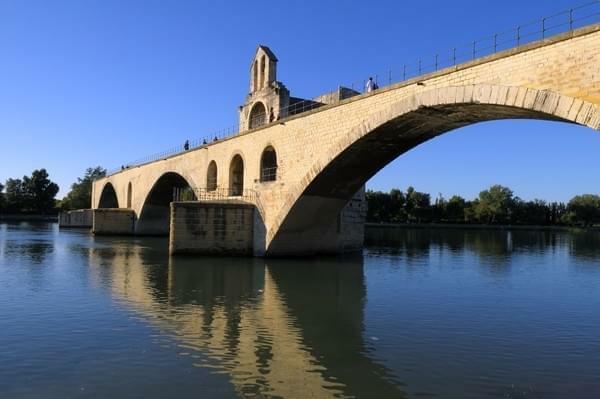 -Mercure Pont D'Avignon, nice hotel near the Bridge of Avignon and the Palais des Papes. -Kyriad Avignon Center Palais Des Papes, elegant hotel in the pedestrian area of ​​the historical center of Avignon. I -Kyriad Avignon Courtine. -ibis Avignon South Styles, 3-star hotel outside of Avignon, it features an outdoor pool and private parking. To find a cheap hotel in Avignon you will have to accommodate you in hotels chains on the outskirts of the city, however, two large hostels welcome everyone. Including the Auberge-Camping Bagatelle, on the Barthelasse Island. This Hotel / Hostel and Campsite has excellent facilities and offers an excellent view of the old city of Avignon. Cost 16.56 euros with free breakfast. Other cheap hotels: -Hotel England 29 Boulevard Raspail 40 euros. -Avignon Hotel Monclar Avenue Monclar (just behind Central Station). Double room with bathroom: 30-60 Euro. In summer, an economic solution can be the campsite, near the Rhône or in the countryside, there are many but the heat can be unbearable in the summer. Allow 15 to 25 euros per location, tent two people. What alternative to hotels in Avignon? vacation rentals offer is particularly important in the Vaucluse department. One can find thousands of offers on the Internet, remember to book several months in advance for a summer stay. A good site to find a farmhouse is the aptly named 'Mas Provencal.net. Several, rentals are more economical than hotels and provide greater independence. Another alternative to hotels, the home exchange, see for example a site like TrocMaisons.com, an online exchange platform between houses especially for a holiday stay in short or extended. You can also go through leasing platforms on the internet, such as Wimdu Wimdu. Wimdu connects owners with vacationers and travelers. It is usually possible to rent to night, week or month. The rental offer is wide and varied; homestays, apartment or house. Finally, another solution, the couch-surfing on couch-surfing.org, a network that connects people offering free bed or a sofa in their home with people seeking foothold for a few days, a solution necessarily economic but serves primarily to meet people, if your hosts have a little time to grant you they will usually be happy to show you their city and their region.